Life does not always go according to plan, and no matter how much thought and effort you put into preparing for the future, you are bound to follow the rules of the universe. 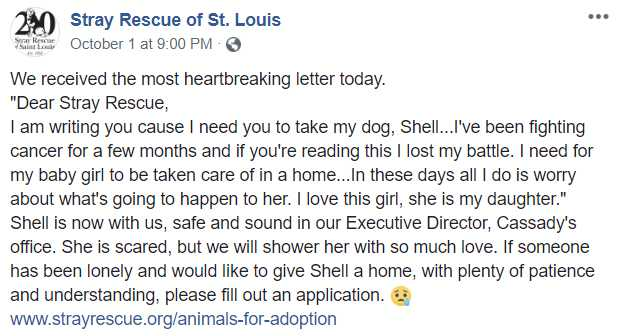 St Louis animal rescue shelter on Monday received a heart-wrenching letter from a woman saying she was losing her battle with cancer and pleading to find a new home for her beloved dog, Shell. The unnamed woman had been battling cancer for some time, and in an effort to make sure her baby wouldn’t end up homeless, she wrote a letter to the shelter. When Shell arrived at the shelter on October 1, she came with that handwritten letter. It told all information about Shell’s background. 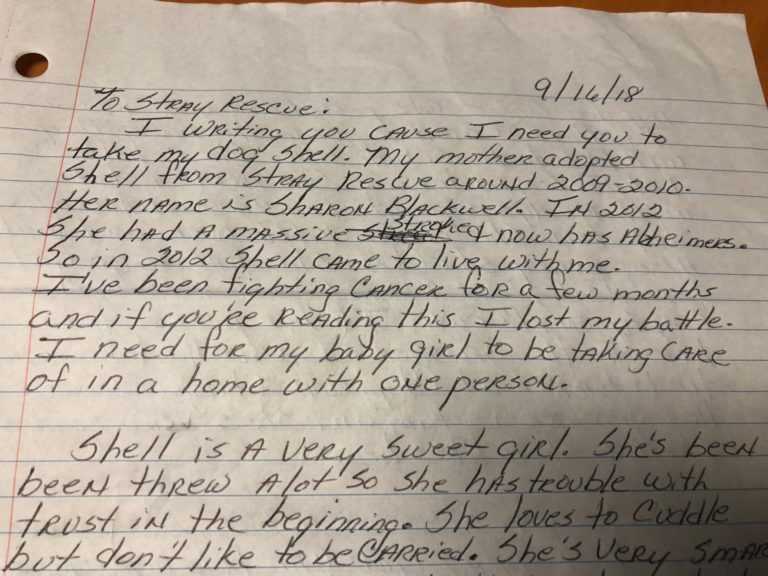 According to the note, the woman’s mother adopted Shell from the same shelter in 2010. Unfortunately, in 2012, she suffered a stroke and was diagnosed with Alzheimer’s. That’s when Shell moved in with her. Shell took up temporary residence in the executive director’s office while she and the rest of the staff helped to get the word out. Taking to Facebook, they searched for the perfect match for a sweet girl who was her owners’s heart and soul. That single post was shared nearly 2,000 times during the next few days hundreds of people wanted to help together grant a woman’s final wish. 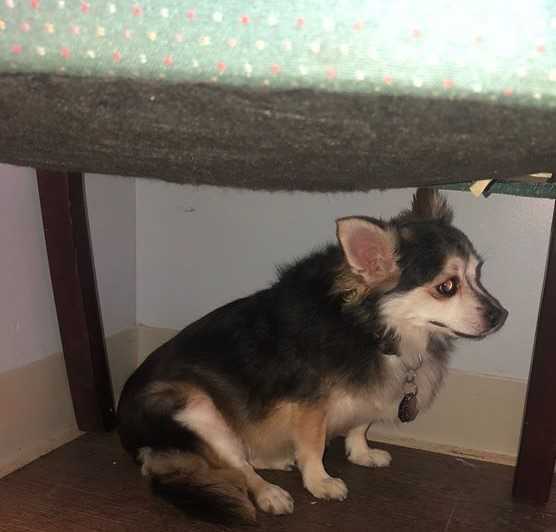 Many people have asked to take Shell in, and on Wednesday the shelter said that the little pooch was on her way to a new home. 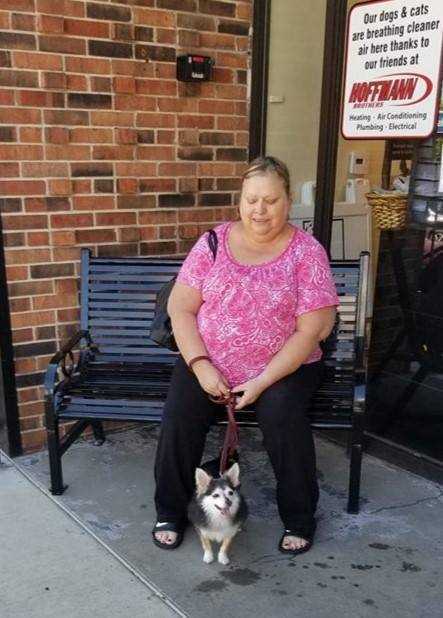 A woman whose dog passed away over the summer and was looking for another furry family member, had adopted Shell. We are hopeful about her bright future.